Laser hair removal has been used by millions of people around the world as a hair removal treatment. The results from laser hair removal are drastically different than what you would get from manual hair removal processes such as shaving, waxing, tweezing, or using hair removal creams. All of these processes provide temporary results, in some cases requiring you to remove unwanted hair again in less than 24 hours. Laser hair removal, however, can lead to permanent hair loss in the treated area in some instances. Here are a few frequently asked questions about laser hair removal. 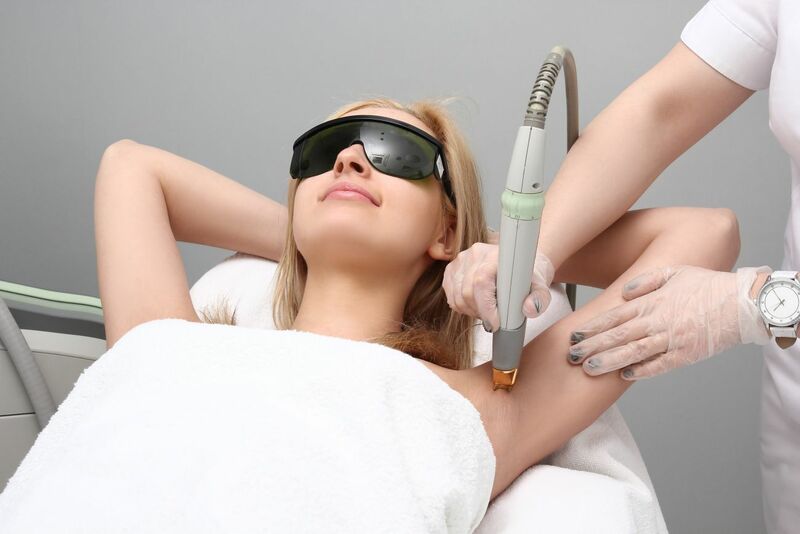 Laser hair removal uses lasers that transmit light at a preset wavelength. This wavelength is absorbed by the pigment in a person’s hair follicle. The light is then transformed into heat, which damages the hair follicle, making it difficult for the hair follicle to produce another hair. All of this is done without damaging the skin surrounding the hair follicle. Because this process relies on the pigmentation of a person’s hair to work, laser hair removal produces better results in people who have lighter skin and darker hair. Can laser hair removal work on any part of the body? Yes. Laser hair removal can safely remove unwanted hair from small, delicate areas like above the upper lip and around the bikini area. It can also remove hair from larger areas, such as on the back, arms, and legs. The only area that is not recommended for laser hair removal is the bony ridge of the eye socket. The answer will vary depending on the size of the area you want treated. On average, it will take 90 minutes to remove hair from a person’s back or their legs. The upper lip or the top of the ears may take a little less than 10 minutes. Laser hair removal practitioners must take into consideration the topography of the area being treated as well as the comfort of their clients. Why does it take multiple laser hair removal treatments to get rid of unwanted hair? To understand this, you must first understand how your hair grows. Human hair grows in a repeating cycle. It is only when your hair is in the phase of active growth that it has enough pigment to absorb the light energy produced by the laser and destroy the hair follicle. If your hair is in the dormant phase of its growth during treatment, it only has a little bit of pigment and will only absorb a fraction of the laser light. During laser hair removal treatment, all of the hair follicles that are actively growing in the treated area are disabled. When you return a few weeks later for a follow-up treatment, some of the hairs that were dormant during the first treatment are now actively growing again and can be treated. After some time and multiple visits, you will begin to experience an increased reduction in hair growth. Laser hair removal should not be an extremely painful procedure. You may experience a zap or a pinching sensation as the laser pulses through the hair. Most people find that laser hair removal is less painful than electrolysis or waxing. In times past, aesthetic lasers delivered a painful jolt of energy, however, modern devices are no longer as painful. Certain factors such as fatigue, caffeine, variance in pain tolerance, and stress can influence the amount of pain you feel during the procedure.